Atoms are the basic building blocks of all matter—at least, that is the conventional picture. In a new study, researchers have fabricated the first superatomic 2-D semiconductor, a material whose basic units aren't atoms but superatoms—atomic clusters that exhibit some of the properties of one or more individual atoms. The researchers expect that the new material is just the first member of what will become a new family of 2-D semiconductors whose superatomic structures will greatly expand the diversity, functionality, and applications of 2-D materials. Xinjue Zhong and coauthors from Columbia University in the US, CNR-ISTM and D3-CompuNet at the Italian Institute of Technology in Italy, and CNRS UMR, University of Angers in France, have published a paper on the first superatomic 2-D semiconductor in a recent issue of Nano Letters. "This work opens the doors to new classes of 2-D materials with potentially greater tunability and control of their physical properties," coauthor Xiaoyang Zhu at Columbia University told Phys.org. As the researchers explain in their paper, the field of 2-D materials is still a very young research area, and most 2-D materials currently have relatively simple structures. Graphene, for example, consists of a single layer of carbon atoms. In contrast, the bulk materials studied in solid-state chemistry have a much greater variety of structural complexity, which has led to an assortment of electrical, optical, and magnetic applications. In the new study, the researchers show that designing 2-D materials with a superatomic structure may provide a path toward realizing greater diversity and resulting applications. Although superatomic materials have previously been demonstrated in three dimensions, so far it has not been possible to prepare these materials in two dimensions due to a lack of covalent bonding between the superatoms. Here, the researchers investigated a little-studied material called Re6Se8Cl2, first reported in 1983. 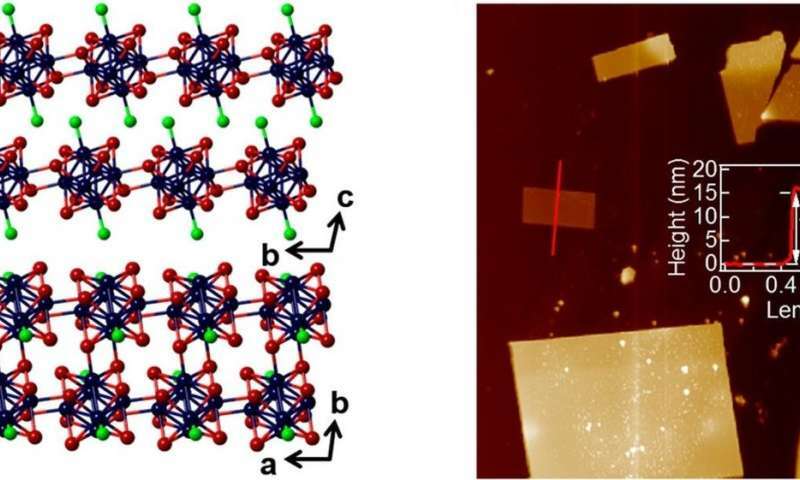 Their analysis revealed that the material's structure does not consist of layers of single atoms as in graphene, but of "pseudosquare lattices of tilted clusters" characteristic of a superatomic structure. In this material, the superatomic clusters are linked together by strong covalent bonds, yet the interactions between layers are weak, making it possible to exfoliate thin sheets of the material while maintaining its superatomic structure. Using the Scotch tape method, the researchers produced superatomic flakes roughly 15 nm thick, and are currently working on preparing monolayer flakes. Based on their initial tests of the electronic and optical properties of the Re6Se8Cl2 flakes, the researchers expect that the uniquely complex structure of such superatomic 2-D semiconductors will offer a promising approach toward realizing 2-D materials with novel, tunable properties and functionalities. "We plan to explore multi-functionality, control of electronic and phonon degrees of freedom, and strongly correlated physical phenomena in these new 2-D semiconductors," Zhu said.